A while back we told you about WhatsApp’s ability to revoke sent messages in its beta version. Now most of the times when a feature is in beta it is most likely to be rolled out to the production version. WhatsApp has finally rolled one of the most requested features to its Android, iOS and Windows Phone app. The ability to revoke messages is being called as the “Delete For Everyone”. 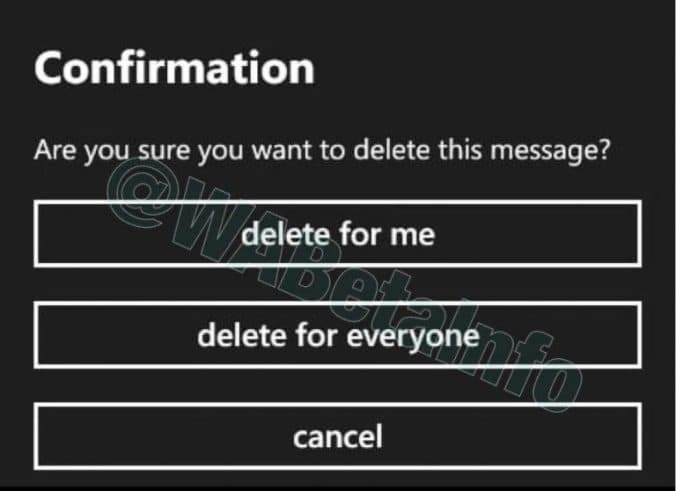 The feature has been named as such because when you try to delete a sent message it gives you the option of whether you want to delete it for yourself only (Delete For Me) or delete for both parties or all the members of the group (Delete For Everyone). The Delete For Everyone feature is being rolled out very slowly to all users. We say slowly because it was rolled out to certain users in certain countries and was later stopped altogether. WABetaInfo reports that this feature will roll out again in a phased manner in about 12 hour’s time. With the “Delete for Everyone” you can delete almost every kind of WhatsApp communication including text, images, videos and voice messages. The “Delete for Everyone” feature works in the following manner. When you activate the feature WhatsApp sends a fake copy of the message. This fake message does not show up on the notification nor is it shown on the chat history. However there are some conditions for the “Delete for Everyone” feature to work. The first condition is that both the parties must have the updated version of the WhatsApp app for their respective platform. Secondly, you must select the “Delete for Everyone” option within seven minutes of sending the message. Any quoted messages cannot be deleted for the meanwhile and if you are using WhatsApp on Symbian you cannot access or implement the feature from the other end. Once the message has been deleted for both the parties the following things happen. If the recipient is using iOS then the notification will be deleted from the action centre. 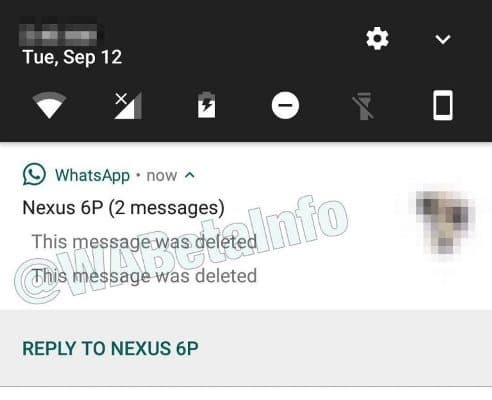 If you are using Android then the notification shall change to “The message was deleted”. In the chat history you shall see the chat bubble with “This message was deleted for everyone” if you are the recipient. 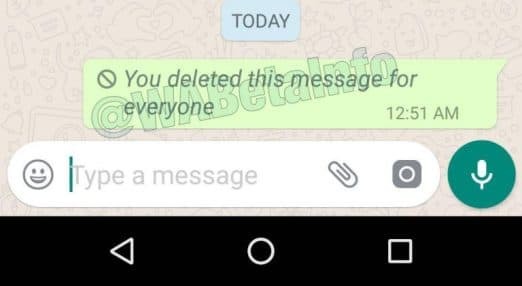 If you are the sender then it shall read the prompt “You deleted this message for everyone”. We can say for certain that this is being rolled out very slowly to avoid any server issues because we have not received the feature even after updating the app. The “Delete for Everyone” will be enabled by the server side even if it was added in the updated version. 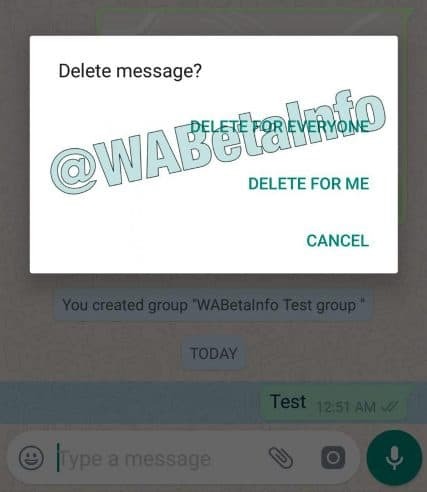 This feature is official as WhatsApp has updated the FAQ page with the “Delete for Everyone” feature. If you have received the feature please let us know in the comment section below. You guys remember this discussion we had? Delete an undelivered message on WhatsApp Looks like WhatsApp is acknowledging this universal problem.